When we at Happenin’s in the 'Ham heard that a bikeshare program was coming to Birmingham, we were very excited! When we heard that some of them would be electric assist bikes, we knew we had to take them for a test ride! The program started out as REV BikeShare, but is now called ZYP BikeShare. We love to ride bikes and actually built the two bikes we own from scratch at the BiCi Coop*. The problem we have is that there isn’t anywhere near our house that is suitable for a bike ride. 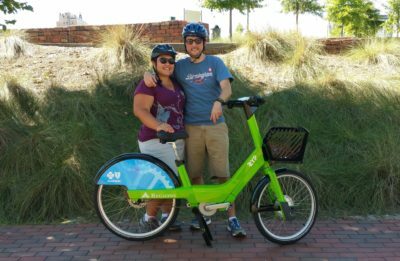 We also don’t want to have to haul our bikes downtown each time we go to Railroad Park or to the Jones Valley Trail. This bikeshare program will allow us and others to park downtown and have access to state of the art bikes that we can use to navigate the city! The great people at Zyp were gracious enough to let us take two of the bikes out for a ride. 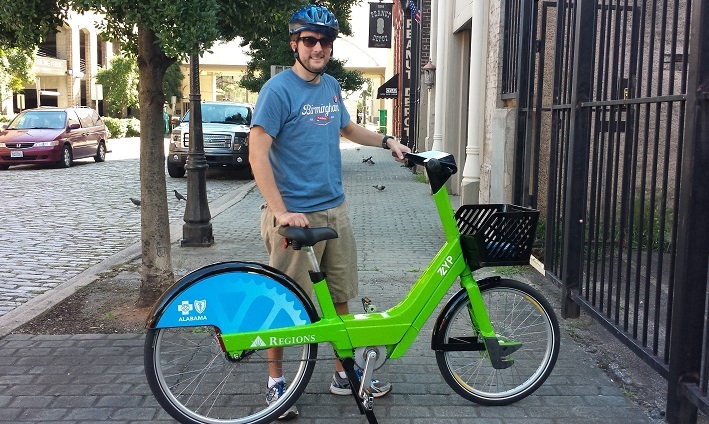 Here is a rundown of our experience biking through Birmingham on the Zyp Bikes. We met up with Michael Symes, Lindsey West, and Olivia Hart at the REV offices downtown. They explained how the program is going to work (more on that later) and showed us how to operate the bikes. Since 40 of the eventual 400 bikes are going to be electric assist or “Pedelec” we tested one regular bike and one Pedelec bike so that we could compare the two. The bikes themselves are Regions “Life Green” and have a blue Blue Cross Blue Shield panel on the back wheel. You shift gears using the handles. The Pedelec version we tried out had multiple gears, but will be changed to have just one gear in order to reduce weight and provide a better user experience once the electric assist kicks in. The time had come for us to begin the test ride. I started out on the Pedelec while Amber started with the standard bike. They look identical as of now, but the pedelec bikes are going to have an emblem that will help users differentiate between the two. The seats were easy to adjust and can be adjusted on the fly, which is good given I’m 6’2” and Amber is 5’4”. Each bike has a basket and will have a cup holder for your water, or other beverage of choice. (PSA: While there will be stations in Avondale, Happenin’s in the 'Ham and Zyp would like to remind everyone that open container laws apply to bikes as well.) The bikes have a screen mounted on the handle bars that keeps track of your time on the bike and distance ridden. The handling was very smooth as we started to build up speed. It didn’t take long for the electric assist to kick in and boost me forward. It takes a minute to get used to the extra boost, but it is a lot of fun! 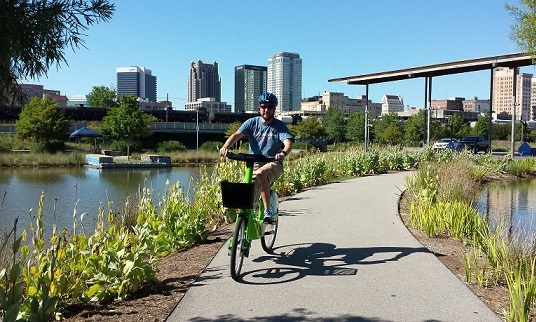 We took the bikes from Regions Plaza to Railroad Park and began to take on some hills. If you have some speed built up and start heading up an incline the pedelec will kick on and take on the hill with no problem! I felt like I was on a scooter. After riding around the park Amber and I switched bikes. She had already gone up a hill on the manual bike and was pleasantly surprised at how effective the electric boost was! At this point I knew that MY time on the pedelec was done for the day as she began to have a blast zipping Zyppin' around the park. The bikes handled well and were a lot of fun to ride. We got a lot of interested looks. A few people stopped us and asked about the bikes expressing excitement about the bikeshare program. We biked to Morris Ave. to take some photos, but I don’t recommend biking on the brick. It was not the best idea. After some quick photos we returned to the REV office and dropped off the bikes. 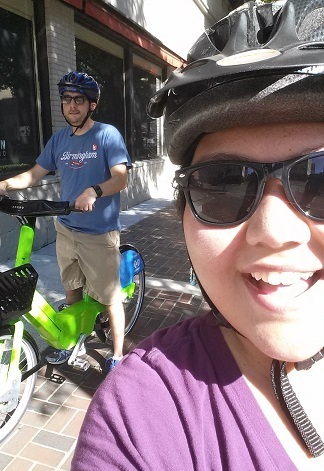 We were already interested in getting a membership, but the test ride sealed the deal for us! There will eventually be 40 stations in and around the metro area. Each station will have 10 bikes for a total of 400 bikes! Each bike has a GPS tracker for security purposes. Once you have purchased a membership you just have to swipe a token to access a bike. -How much money have you spent this season on parking for Baron’s games? -How much food or beer could you have bought by saving $40 on Sloss Fest parking? -Wouldn’t it be nice to ZYP around Sidewalk Film Festival? -Have you ever wanted to go from 5pts to Lakeview or Avondale, but didn’t want to fool with moving your car? These are just a few reasons why Birmingham should embrace this program. It is the FIRST program of its kind in the WESTERN HEMISPHERE and it is here in Birmingham! The program launches Monday 8/17 with Shyfter memberships. Become a Shyfter by being one of the first 200 people to sign up and you will get all kinds of cool incentives and some bonus gear! These are being sold on a first come basis, so act fast! Sign up at www.zypbikeshare.com. The team will also be doing test rides at this year’s Sidewalk Film Festival! Thank you SO much to REV Birmingham and Zyp! It’s nice to have you in Birmingham! All rights reserved. All Images are the property of Happenin's in the 'Ham unless stated otherwise and may not be used without written consent.